Military Agrees To Provide Chelsea Manning With Hormone Therapy : The Two-Way Manning, convicted in the biggest leak of classified information in American history, announced she was a woman in the summer of 2013. This is the first time the military makes such an accommodation. The U.S. military has decided that it will provide Chelsea Manning with hormone therapy while she is a prisoner at the Army's Fort Leavenworth prison. If you remember, Manning, the army private who was convicted in the biggest leak of classified information in American history, announced that she was a woman in the summer of 2013. She said she wanted to begin hormone therapy immediately and sued the military to allow it. Pfc. 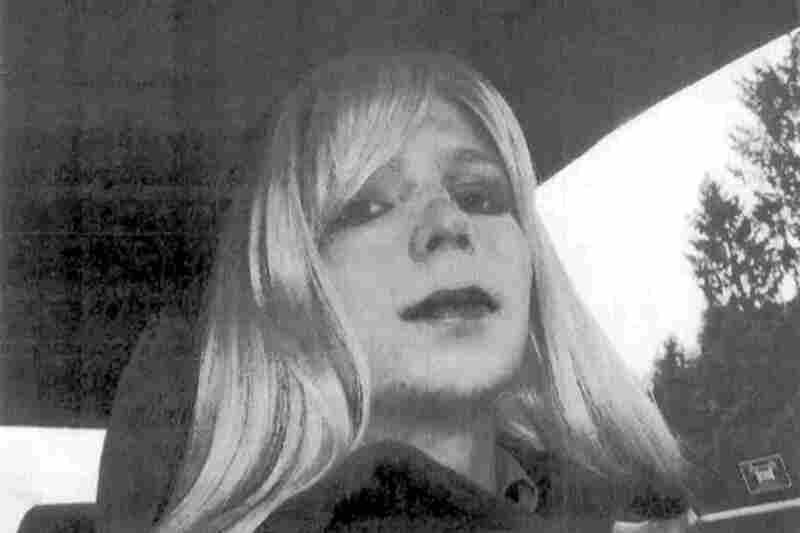 Chelsea Manning poses for a photo in 2010. According to USA Today, which broke the story, this is the first time the U.S. military makes such an accommodation. As we've reported, courts in the civil system have decided that not providing hormone therapy to transgender inmates is cruel and unusual punishment, but the same wasn't so of the military. "Manning has asked for hormone therapy and to be able to live as a woman. Transgenders are not allowed to serve in the U.S. military and the Defense Department does not provide such treatment. The Department of Veterans Affairs, however, does provide the treatment for veterans. "Last month, Air Force Secretary Deborah Lee James told USA TODAY that the ban on transgender troops is likely to be reassessed and should be lifted." The AP reports that lawsuit filed by Manning alleged that while the Army was providing some treatment for her gender dysphoria, it was not doing enough. "[The lawsuit] alleged Manning was at a high risk of self-castration and suicide unless she received more focused treatment," the AP adds. Manning, formerly known as Bradley, is serving a 35-year-sentence at the maximum security facility. We reached out to Manning's attorney as well as Fort Leavenworth for comment, but have not heard back. If we do, we'll update this post. Chase Strangio, the American Civil Liberties Union attorney representing Manning, said this is "an important first step." "The military continues to refuse to let Chelsea grow her hair like other female prisoners, a critical part of her treatment plan that has been recognized by her doctors. The resistance to meeting Chelsea's full treatment needs is a reflection of the deeply entrenched stigma associated with transgender health care. There is no transgender exception to the requirements of the Eighth Amendment and we will keep fighting for Chelsea's health needs until she is treated fully and adequately. It is additionally concerning that private medical information about Chelsea's care was again leaked by government officials despite clear protections in federal law and the existence of a protective order."